Don't let the numbers fool you: While the Knicks are marginally better with Derrick Rose on the floor, they'd be much better off in the long term without him. Derrick Rose is playing his best basketball in five years and it isn’t enough. This is the cold reality of New York’s situation; even a best-case scenario from one of the Knicks’ riskier off-season additions has landed them at 17–21, good for 11th place in the Eastern Conference. Rose is exploding toward the rim in a way we haven’t seen in years. His finishing around the basket, once a sad reminder of all that his game had lost, has perked up in a meaningful way. The 17.3 points and 4.5 assists that Rose contributes nightly, while slightly misleading, are valuable to the Knicks. New York’s offense flounders in his absence—a state which recent events have made pertinent in the strangest way possible. No team in modern NBA history has had a healthy player go truant in the fashion Rose did this week. The official reasoning, given both to the team and to the media only after the fact, was a family emergency. Much of the reporting has centered around Rose’s mother, whom he visited. Mention has been made of Rose missing his son, who still lives in Chicago. Unnamed sources have characterized Rose as an “emotional wreck” in the hours before his no-show. Rose himself said that he did not respond to the team’s attempts to reach him because he needed his “space.” Everything about this story paints it as an unusual, exceptional case, and yet the Knicks seem intent to move on as quickly as possible. Rose was fined without suspension and will be back in the starting lineup Wednesday night. The profound weirdness of the event coupled with the basketball developments that proceeded it suggest the cloud around Rose won’t soon dissipate. In the fourth quarters of back-to-back games, Knicks coach Jeff Hornacek benched Rose in favor on the seldom-used Ron Baker. The most relevant case (given that one of the two games was somewhat of a blowout) paid off; Baker’s minutes against Milwaukee coincided with a 33-15 run that ultimately led to a five-point Knicks win. There was merit to benching Rose, then, on basketball grounds. There are also grounds to bench him now for his vanishing into the night, though New York decided against it. In either event, the Knicks have more cause than ever to carefully weigh what it is that Rose gives them. New York’s offense has not functioned well without Rose in play, though reading causality into that fact seems ill-advised given how many of Rose’s minutes overlap with Kristaps Porzingis and Carmelo Anthony on an otherwise shallow team. Still, the structure of a Rose-Brandon Jennings-Baker point guard rotation seems altogether more stable than any alternative. If you reduce Rose’s minutes or try to bring him off the bench, you lose him. If you send him home altogether, you run perilously thin at the position when the team trails the No. 8 seed by just two games in the loss column. Whether that ultimately matters requires a different sort of calculus. The Knicks without Rose are likely a worse team, no matter his faults. Rose shoots 36% outside the paint, barely gets to the free throw line (he ranks 41st out of 50 similar-usage players in free throw attempts per minute), and isn’t a long-range threat. Still his drives make a difference in the initiation and momentum of New York’s offense—something that Jennings and Baker cannot imitate. There are inevitably possessions where a singularly focused Rose drives into traffic with his head down. Such is the cost of doing business with a guard whose vision is not—and has never been—his strong suit. Rose went into this season intent to prove himself and has taken to attacking the rim as a means to do so. He’s succeeded, in a sense, but the asterisks in Rose’s game remain fairly significant. There is an imposing ceiling on the value of a player who does not score efficiently, does not play a significant role in making his teammates better, and offers little to nothing as a defender. That last bit cannot be overlooked. Rose has two particularly destructive qualities as a defender: his tendency to hop around in an effort to contain opponents often throws him out of position; and his inability to work over screens (a necessity given the NBA’s current style) dooms possessions just as they start. In tandem, these qualities make Rose unreliable and unpredictable. Help defenders have trouble positioning themselves around Rose and preempting his blow-bys. Alternatively, the need for that help has created problems elsewhere when teammates have attempted to anticipate a Rose mistake. There isn’t enough collective speed and athleticism on the back line to make up for a defender whose positioning is so erratic. It is not a surprise that most every big-picture defensive metric available paints Rose as a trainwreck. Given that, whatever Rose does give his team offensively has to be weighed against a substantial negative. This is a better-than-expected contract year for Rose and still the balance of his game is, at its most generous characterization, precarious. His play has been okay. 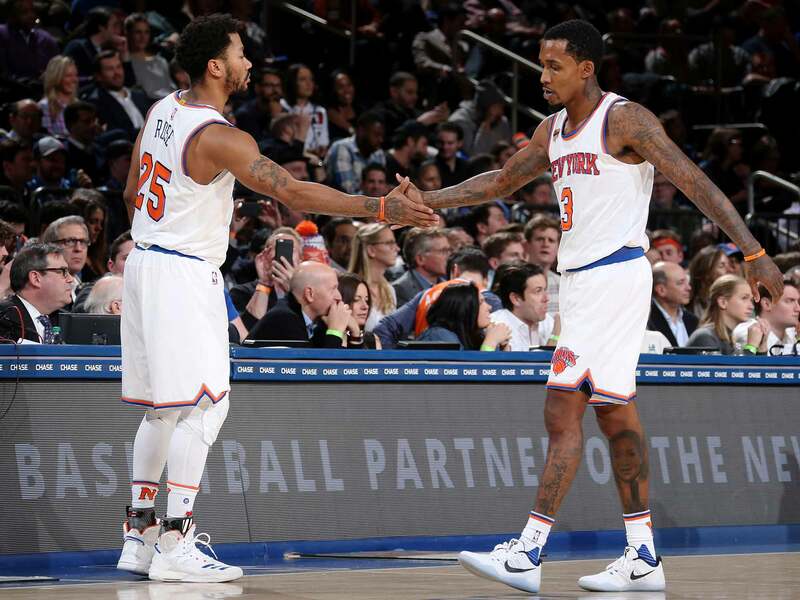 Reputation and solid box-score performance has overstated what Rose brings to the Knicks, though the sharper elements of his game have also aligned with some of New York’s specific needs. The question lingering in light of Rose’s unplanned (and still largely unexplained) absence is how much that really matters. Marginalizing or parting ways with Rose would take a somewhat dynamic element off the board for New York. It might also clear up some of the nonsense surrounding a bothersome veteran point guard who really should not be a member of the Knicks next season. Need, in this case, is a complicated premise. Rose fills a certain void at times, but for what? New York is not some sleeping giant poised to shake up the league upon its waking. It is a middling team that after ebbs and flows has ended up largely where it should. Rose is very much a part of that, for better or worse, but hardly above it. There is nothing in his game that should shield him from the fallout of his unprecedented disappearance.